I got new kitchen tools for Christmas. I’m not always swayed by new fandangled kitchen gadgets. They’re often pointless and end up collecting dust until getting “garage sale-d” with the other junk. 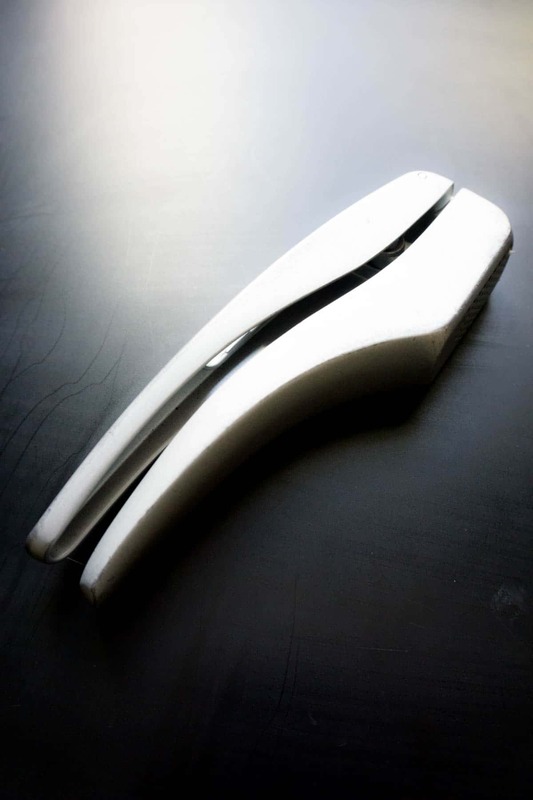 Like mandolin slicers… an emergency room visit just waiting to happen! But sometimes you find a gadget that totally changes everything and you can’t believe you ever lived without it! My new gadgets got me thinking about what’s really essential to everyday cooking. 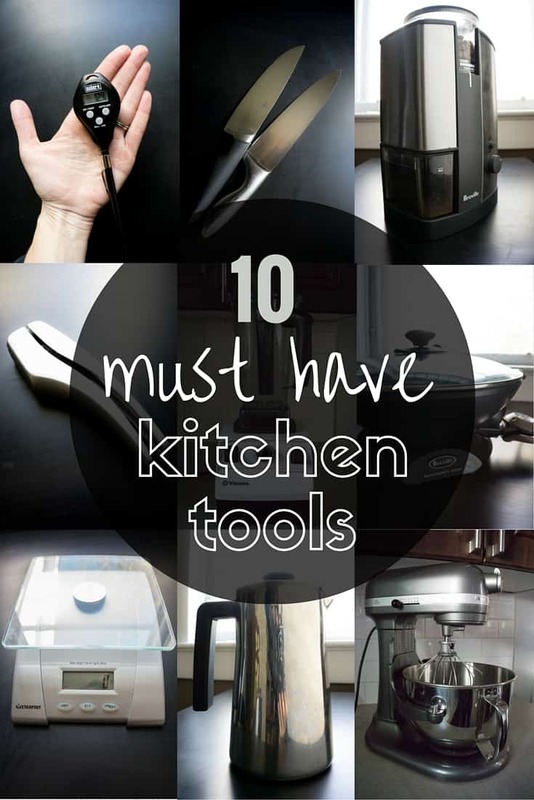 Here are the 10 kitchen tools I truly couldn’t live without. I’m a garlic maniac. You’d be hard-pressed (get it?) to find a dinner recipe on my site that doesn’t include garlic. When I make someone else’s recipe, I usually double the garlic. So I go through a LOT of garlic. My life was made 100 times easier when I discovered pre-peeled garlic. Since I no longer have to do the tedious work of peeling garlic, I throw even more garlic into my recipes. This means I need a quality garlic press. I’ve had a few garlic presses in my lifetime. This is one item where you do not necessarily get what you pay for. We were given an expensive Henkel press as a wedding gift, which was great… for a month. Then it became dull and hard to press. A few months later it was completely broken. Thankfully I have an obsessive husband who researches nearly every purchase he makes. 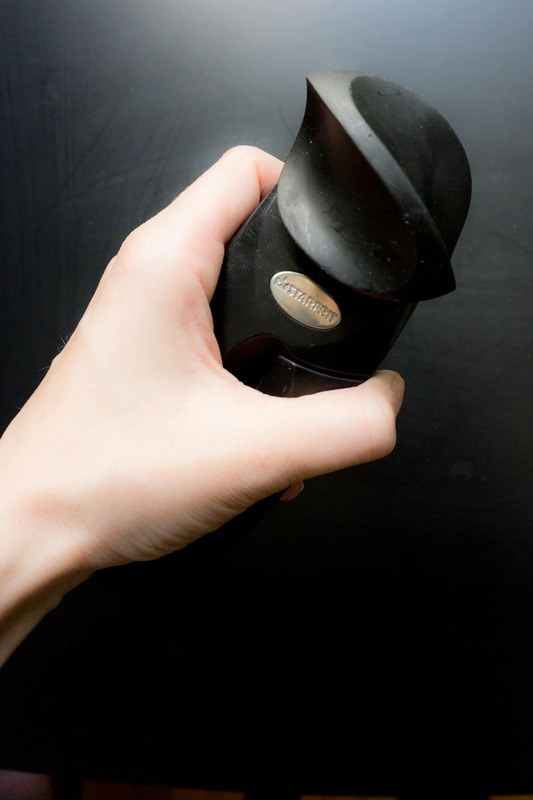 You might consider it overboard… it would never even cross my mind to research a garlic press. But he did, and I’m eternally in his debt because he found me the world’s best garlic press: the Zyliss. I’ve had it for over four years now and it’s just as good as the day I got it! The cloves just press through like butter. And there’s no waste. ALL the garlic gets crushed. It’s amazing. Check out the listing on Amazon. It gets a 4.6 star rating and is a great price. When I’ve been able to find this in real life stores it costs about 50% more. This is the KEY to perfectly cooked meat. Unlike the garlic press, I don’t have an allegiance to a certain brand of thermometer. As you can see in the photo, I own a Weber, which I’ve been quite happy with. However, I must warn you, it is not exactly an “instant” thermometer. 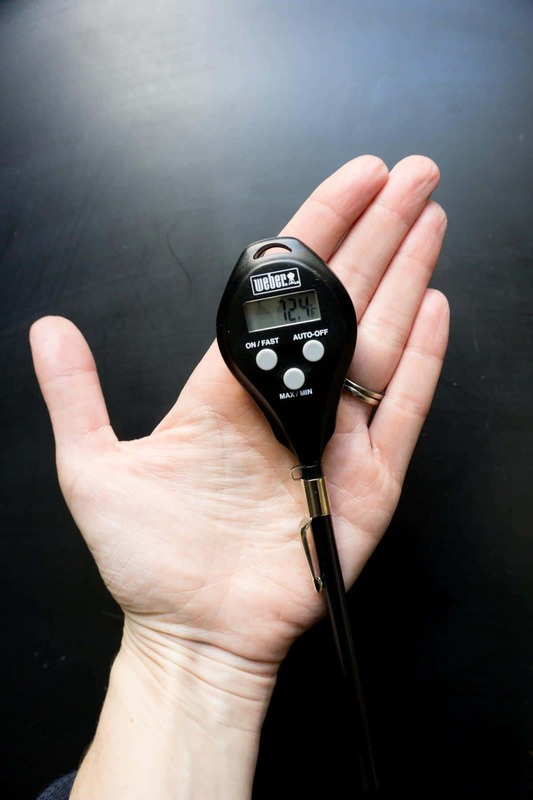 It can actually take up to 30 seconds for the accurate temperature to register. While this is only a minor inconvenience, I’m pretty impressed by another thermometer, which claims to read in a mere 4 seconds. The rating is 4.5 stars with the reviewers backing up the quick temps. One reviewer said it was fast at high temps but took longer with lower temps. All in all, I’m temp-ted (get it?!) to put it on my wish list. I feel like a blender snob when I write recipes that require blending. Since I use a high-powered blender to test my recipes I don’t know how they will turn out using a standard blender. So I usually write “high powered blender” in the instructions. I don’t mean to be exclusive but I don’t want someone to try a recipe and be completely disappointed because it did turn out well. I learned this lesson the hard way. I had a recipe for a Berry Orange Smoothie in my Free 10-Day Healthy Breakfast Challenge. I asked for feedback on the recipes and someone complained that the orange didn’t blend well, which gave the smoothie a gross texture. I felt a little sheepish when I read that review. Of course that would be gross. Only a high powered blender could blend an orange nicely. So I swapped out the orange for a banana in the recipe. This is also tasty, but if you eat a lot of smoothies an orange is a nice change from all the bananas. I know the high powered Vitamix and Blendtec blenders are pricey. But if you regularly eat smoothies, hummus, and nut butters you’ll actually end up saving money. I’ve calculated that my Vitamix actually paid for itself in less than a year on hummus savings alone! 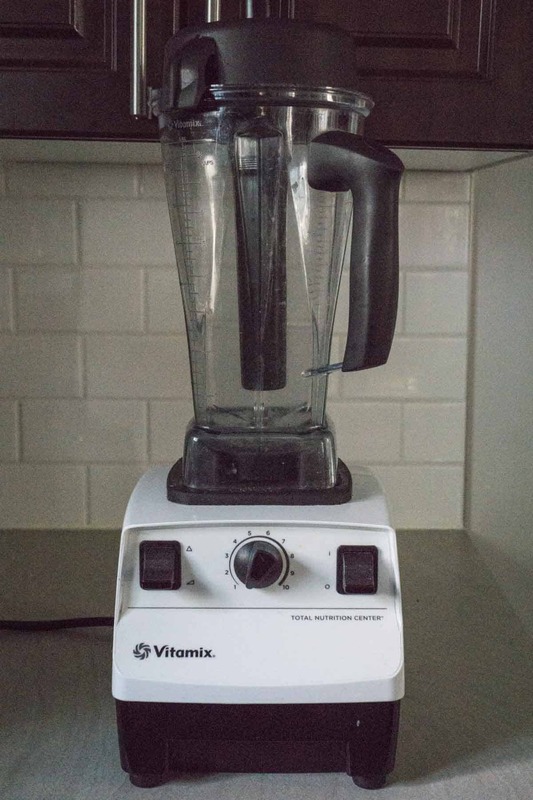 Read more about how a Vitamix can save you money! 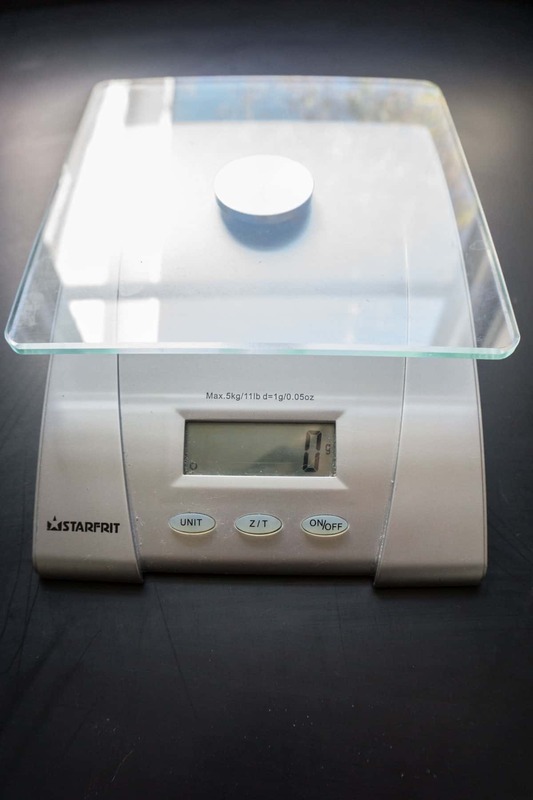 If you want precision, a kitchen scale is a must. The Europeans have it right. Most of their recipes call for ingredients to be weighed. A cup of flour can vary in weight by as much as 50% depending on the method used to measure it. This is why I highly recommend using a kitchen scale when getting into a sourdough starter. But a scale is useful for a lot more than that. For example, it’s super handy for dividing ground meat into one pound measurements when buying in bulk. I’ve had this scale made by Starfrit for several years and I’ve never had any issues with it. I really like the flat surface. I can measure food directly on it, or place my mixing bowl on top and measure while I pour it in. It has a 5 kg capacity, which is a generous amount IMO. I’ve never blown over it! It’s also accurate to within 1 gram. I also think this bamboo scale is just gorgeous! It has a 7kg capacity and has a terrific rating on Amazon. I hemmed and hawed for several years about which brand of stand mixer to buy. I ended up getting a Kitchen Aid because I was unhappy with the customer service on my Cuisinart toaster oven, the other brand I was considering. Plus, the Kitchen Aid has counter appeal! 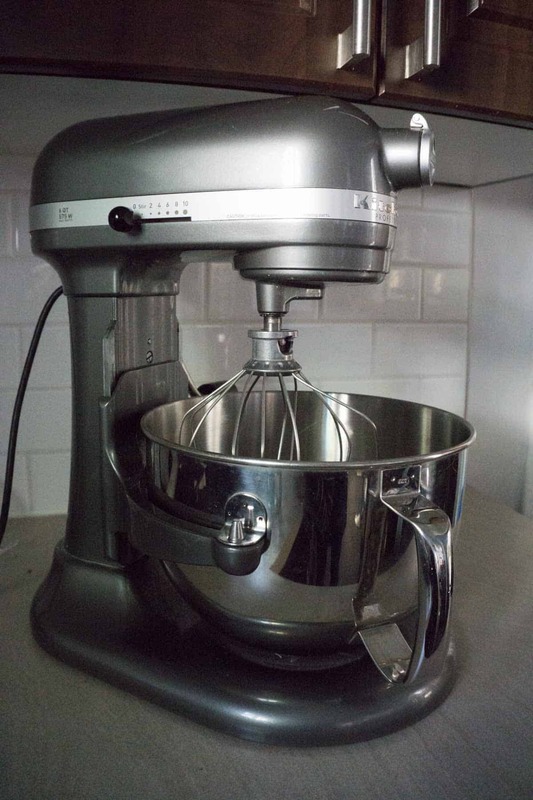 The Bosch mixer gets great reviews and is known for handling bread dough very well, but…. it just isn’t as pretty. Shallow, I know. But I knew I wouldn’t be happy leaving the Bosch on the counter, and I didn’t want to have to haul a mixer out of the cupboard all the time. So, if you don’t have enough counter space anyhow, you might want to consider the Bosch! Admittedly, I’ve never used one but I’ve heard glowing reports. When it comes to a Kitchen Aid, there are a million different options, some in a million different colours. I ended up opting for larger capacity (6 qt) because the size comes in handy when doubling or tripling recipes. If I just need to whip up a small quantity of something, I’ll reach for my hand mixer instead. If you are an avid baker, a stand mixer will save your life. It’s so nice to be able to toss ingredients together, turn the mixer on, and let it do its thing. It gives me a few extra minutes to put ingredients away and tidy up the kitchen as I go. 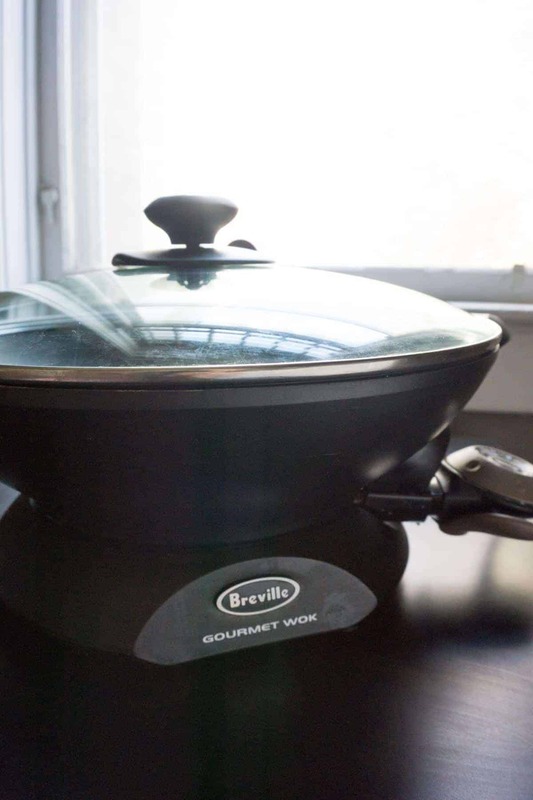 I use this for making a lot of one pot meals, such as Texan Turkey Quinoa, Mediterranean Lentils and Quinoa, or Lemon Orzo Shrimp. And, of course, it’s also fabulous for stir-fries too! One of my family’s favourite meals is the Peanut Chicken Stirfry. These two items, of course, get DAILY use in our house. I find they are both key to achieving coffeehouse quality coffee at home. 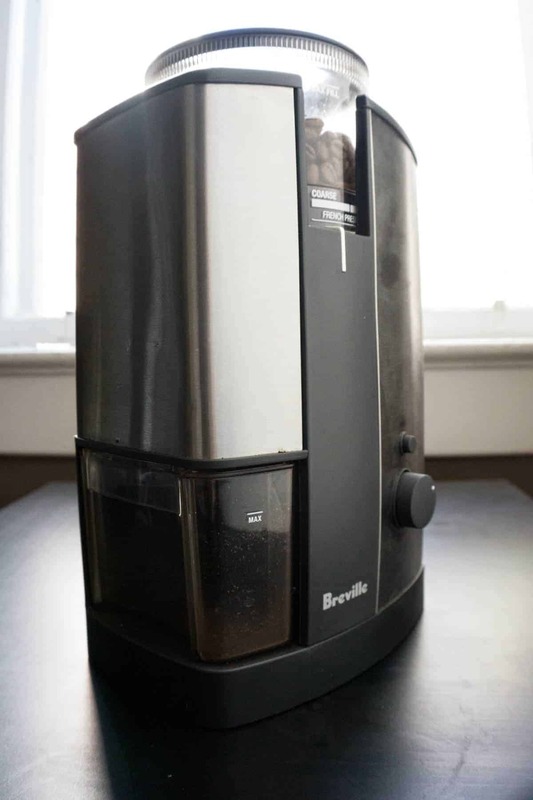 This Breville coffee grinder is the second burr grinder I’ve owned. The previous one had some annoying features. The chute would fill up with coffee dust and clog completely, unless I cleaned it out with a tooth pick every week. The canister was also extremely staticky, so pouring the grinds into the French press caused them to fly everywhere. What a mess. I’m happy to say that neither of these things happen with the Breville! It’s a dream to use. It gets a 4 star rating on Amazon. The negative comments are rather minor. Some people have problems with the on/off button accidentally getting bumped. This has NEVER happened to me. I guess I know my way around buttons. 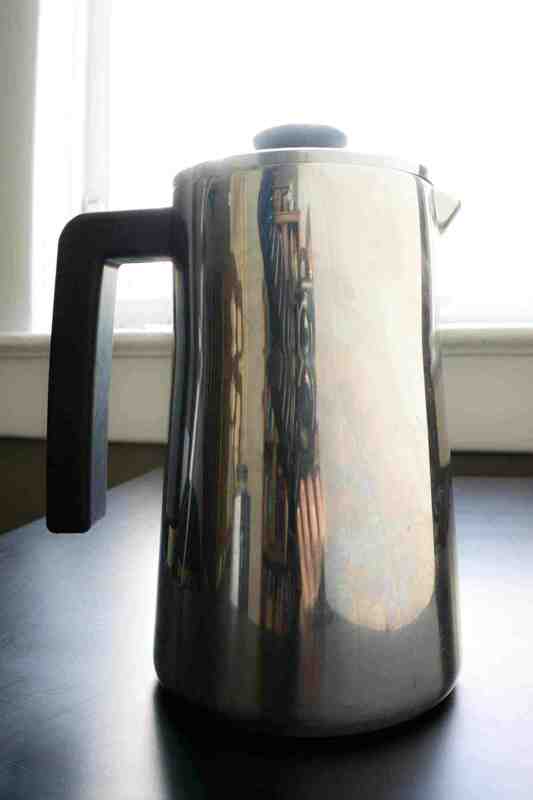 As for a French press, I’d highly recommend getting one with insulated stainless steel. This helps to keep the coffee hot for a while. I used to have a glass one and the coffee would cool off instantly. Also, the reason I needed to get a new one was that it broke. Stainless steel won’t break on you! This one on Amazon gets 4.8 stars and it’s absolutely beautiful! It also has a 1.5L capacity and all the parts are dishwasher safe. This can opener removes the seal off the can instead of cutting into the top. Benefit: the edges aren’t as sharp. I don’t let my toddler play with it, but there’s a lot less risk of getting cut when handling the empty can. It’s also super easy to use. It just glides around the edge, effortlessly removing the top. I can’t think of anything more frustrating then a dull, hard-to-use can opener. 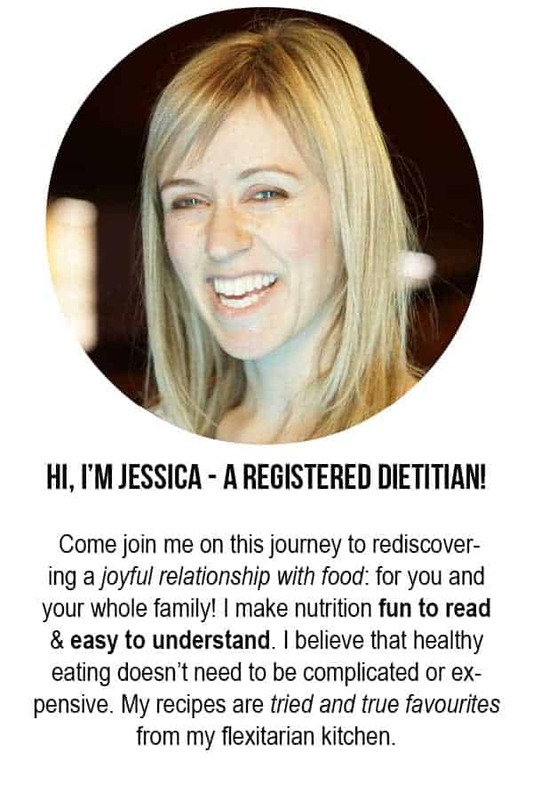 During my time as a Public Health Dietitian I cooked a lot in community kitchens. To save money, these kitchens had dollar store openers. Ironically, the programs probably would have been better off financially if they had just spend a few more dollars on a better opener. Instead they were constantly paying labour costs for the extra time it took us employees to open cans! And they needed to be replaced frequently. Again, this Starfrit opener gets a 4.5 star rating on Amazon… and it sells for under $10! A steal of a deal if you ask me. Acquiring and learning how to use a good chef’s knife is an essential cooking skill. A dull knife is more dangerous than a sharp knife because you will need to use your own force to try to get it to cut. 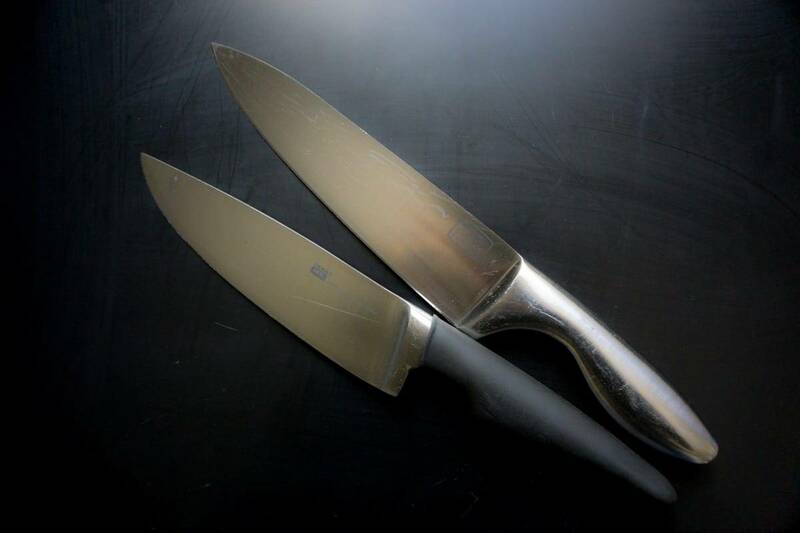 The dull knife is more likely to slip, since it’s not as good at piercing the surface of the food, and meet your fingers. Unfortunately dull knives are still very capable of piercing skin! You can buy a set of knives that contains several different types and sizes. But that can get expensive if you’re looking for quality. I find it unnecessary. I use my chef knives for almost everything. A serrated knife is needed for bread… and that’s pretty much it! My current knives aren’t actually very expensive. Ikea used to carry them. I went with the medium-priced knives and have been very pleased with them! I think the chef’s knife was $15. If you’re ready to take the plunge and invest in a good knife, I would recommend going to a knife store and trying some out. Each one will be weighted and shaped differently. You have to find one that feels comfortable for you to use. It’s like shopping for jeans. Brands are made for certain body types. You gotta find the right brand for your body! You gotta find the right knife for your hands! So it doesn’t matter if your favourite celebrity chef raves about a certain knife. It has to be the right one for you. I’ve been told that Victorinox is a great brand for the home chef. This one on Amazon gets a 4.8 star review from over 3600 reviewers! People tend to develop the habit of eating in predetermined numbers. When I was a kid I was allowed to have two cookies for an after school snack. This number is now ingrained into a habit. When I indulge in cookies, I instinctively reach for two. It just feels like the right amount! It’s simple to hack this eating habit, by simply making smaller cookies! When I make a scrumptious batch of soft and chewy chocolate chip cookies, I use a small cookie scoop. Some might complain that it’s a tiny cookie scoop, but it helps me eat less without feeling like I’m restricting myself. I still instinctively reach for two cookies, but now my cookies are half the size. I’m really only eating the equivalent of one larger cookie. Not only does the Dietitian side of me love the easy portion control with scoops, it makes the job a hundred times faster! Lazy Jessica also loves the scoops! I really love my Oxo cookie scoop. I actually splurged and spent more on my muffin scoop from Epicurious, but I really dislike it. The swivel part constantly goes off track. My Oxo scoop has certainly outperformed the epicurious and is half the price! 4.5 stars from over 1000 reviews on Amazon can’t be wrong either! 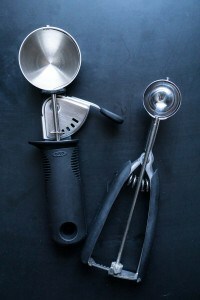 These are my must have kitchen tools! If you made a list, what’s one “gotta have it” item that you’d include? Disclaimer: this post contains affiliate links for all the products listed. Thanks! I found this thermometer at Home Depot. I tried to look for it online but wasn’t able to!